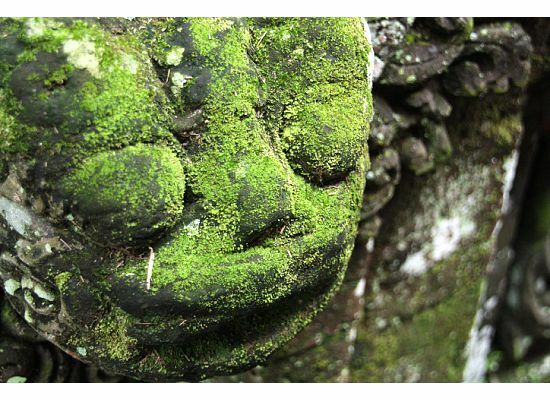 One of my favorite things about Indonesia was the pervasive use of stone and the mossy deliciousness of it all. This is a sculpture at a temple in Ubud, Bali. 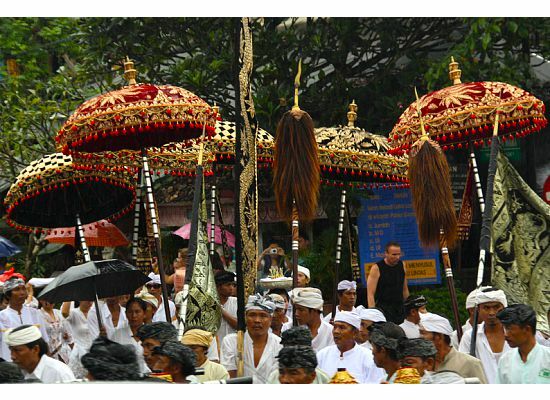 ...but the Balinese dancing and music was awesome. 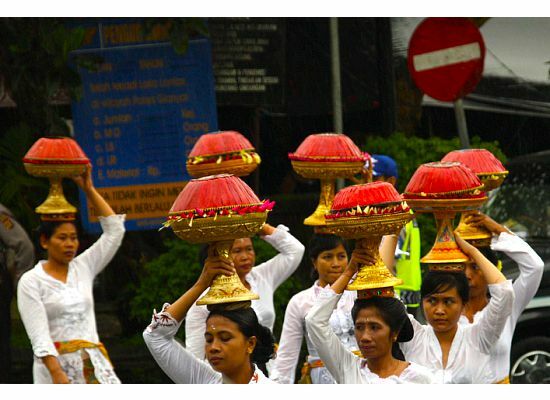 Bali is also famous for the beauty of its terraced rice paddies. 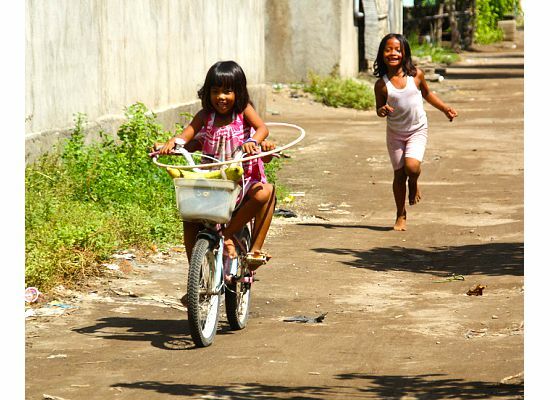 I met some adorable hula-hooping girls in a village on the Gili Islands. The girls take a hula-hooping break to examine some leaves. I didn't want to go to the nightlife mecca of Kuta Beach, but we had to stay there one night in order to catch an early flight out. I was pleasantly surprised at the beauty I found on what I expected to be a miserably overcrowded tourist-trap of a beach. We visited Lake Manyara, in the Great Rift Valley of Tanzania, during the dry season, so much of it was dried up. 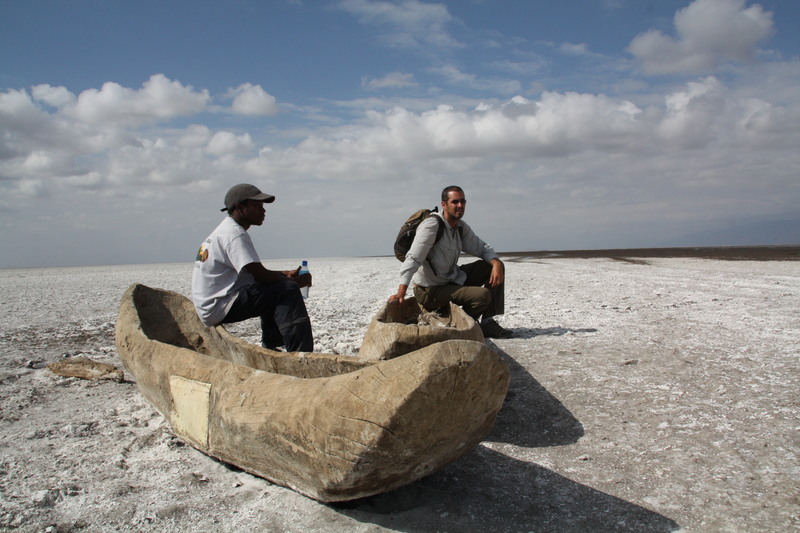 Resting at some beached canoes on the mud flats of the dried up Lake Manyara. The lake is saline, giving the mud flat the whitish color. 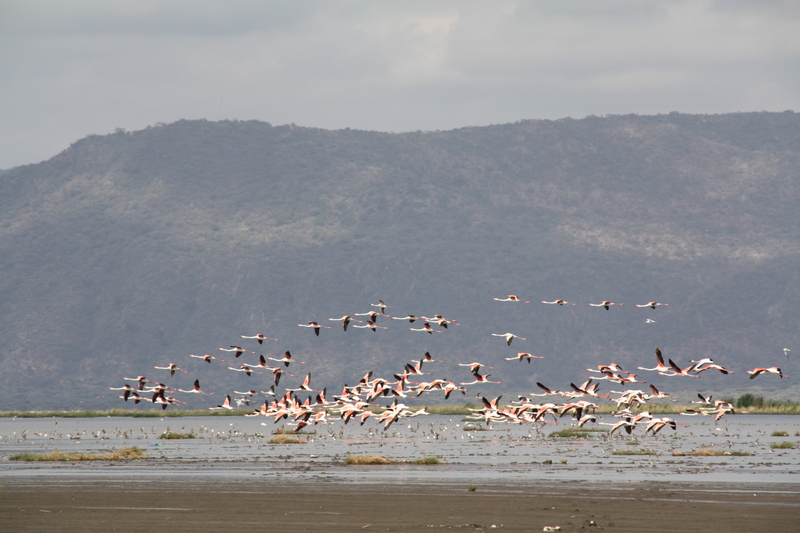 Flamingos take flight: The lake's high alkalinity makes it an attractive home to a large flamingo population. 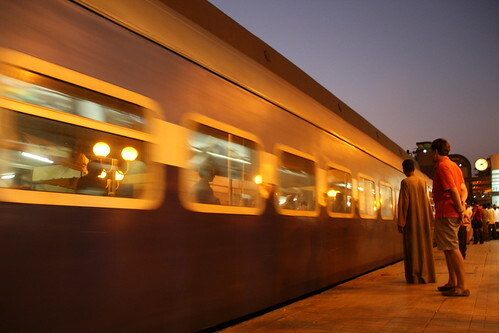 This is our train as it pulled into the Cairo train station. We took an overnight train from Cairo to Aswan. The private 2-person sleeping compartment was surprisingly nice. Not to the standards of a luxury European train or anything, but better than the sleeping compartments we experienced elsewhere in Africa and Asia. 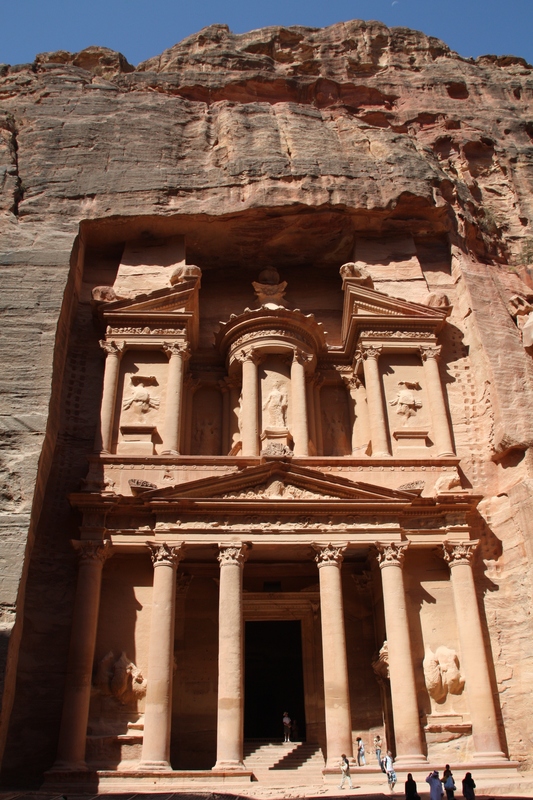 The primary reason we visited Jordan was to see Petra, ruins of the fascinating and little-known ancient Nabataean people. Petra is notable for being built into stone, rather than out of it – the immensity of the negative negative space inside the structures can only begin to hint at what must have been involved in carving these structures – and also, of course, for serving as an Indiana Jones movie set. The scale of the place really made an impression on me. That's Max standing in the doorway. 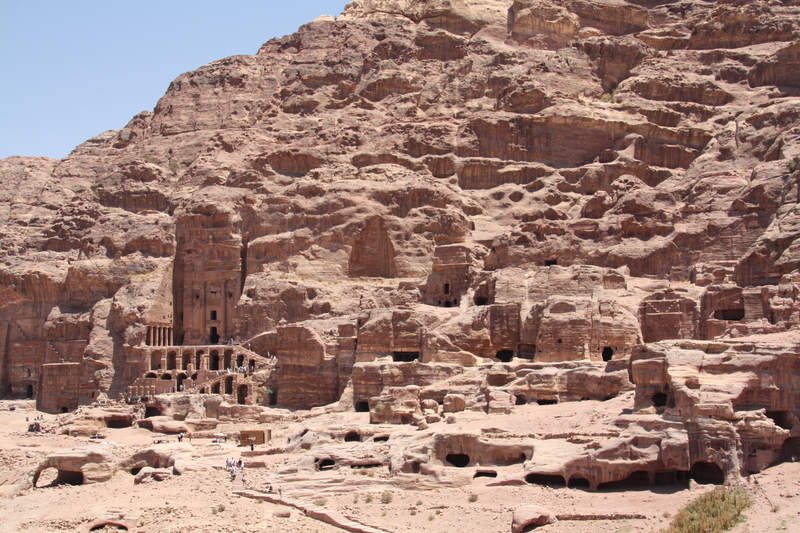 An entire city of caves was carved into the rocks across a huge area. 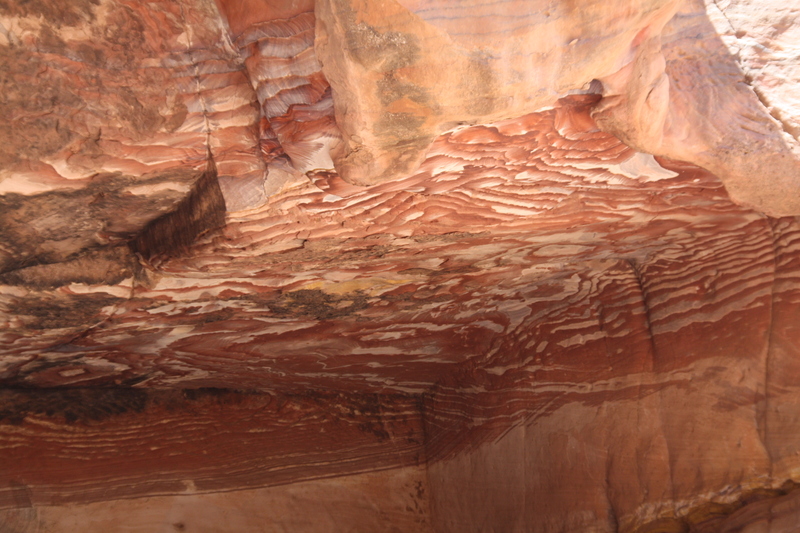 The desert rocks come in an extraordinary array of colors. 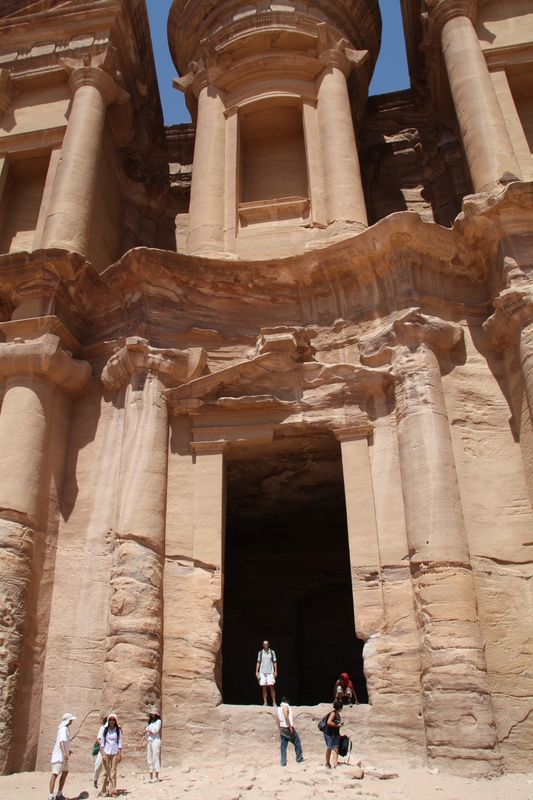 But, one of the best parts of our Jordan experience was our time in Amman. Though the city is not terribly interesting, the hospitality we experienced at the Abbasi Palace Hotel was among the best in the world. 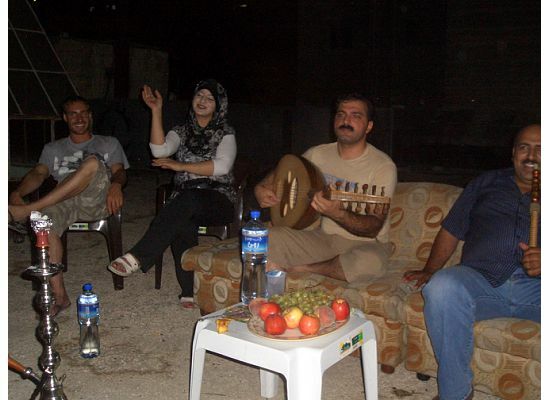 Listening to some traditional rooftop music with the amazing manager of our hostel and her friends. Gary Arndt, author of the travel blog Everything Everywhere, just wrote this great article and slideshow for the Huffington Post (don’t worry conservative friends, it’s not a liberal rant, just go ahead and read it). He’s been traveling around the world for three years now, and compiled a list of 20 things he’s learned about the world. Based on our (much more limited) experience, I agree with all but number 14. On the contrary, I am often shocked at how little interest people have in traveling, or in how off-the-wall they think it is that we want to go the places we go. CHeck it out, it’s worth a read. 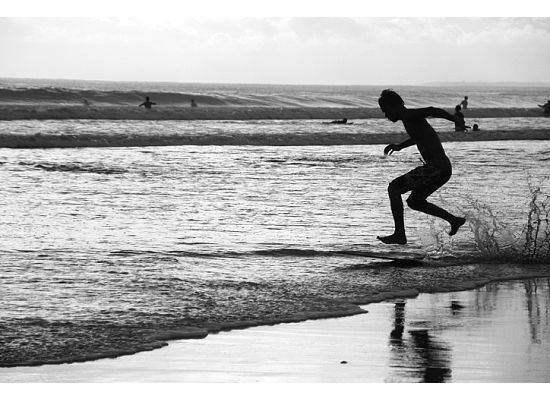 Skinned knees, split ends, calloused feet, and tattered clothes – for better and for worse, we’re back. (Well, I’m back. Max detoured through Argentina to see family and deal with some visa bureaucracy.) Hard to believe it’s already been a year. We would stand there and see faint outlines of shadows, and be fairly certain that there was no cloud cover. 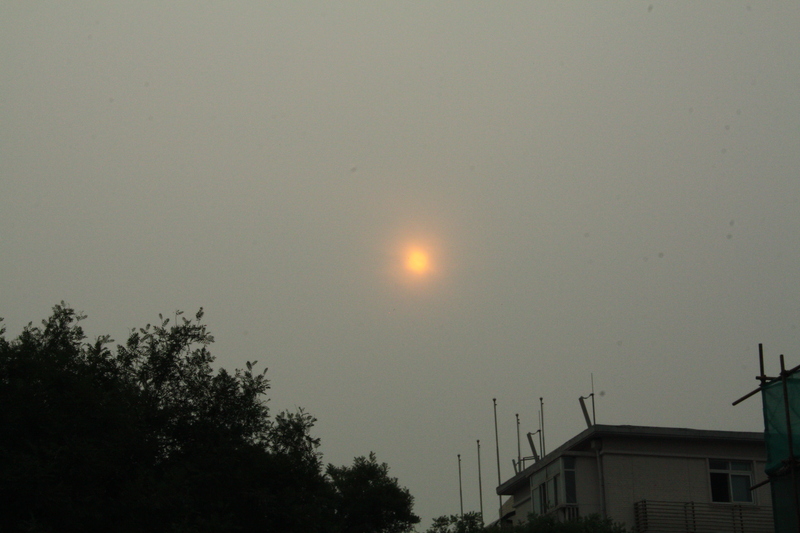 Yet we could often barely make out the sun. City views from high-up places were all but non-existent. To their credit, they are working on it. Solar water heaters and other solar-powered devices are everywhere, as are electric motorbikes and bicycles. But it is not enough. I thought that I had a moderately respectable knowledge of Buddhism for a nonbeliever. Turns out I was wrong. Tibet taught me that I have woefully little understanding of Tibetan Buddhism. Apparently almost all of my prior knowledge to Zen and Theravada Buddhism and the Tibetan variety is markedly different. We spent a lot of time in Tibet visiting temples and monasteries. I was constantly struck by how alive the religion felt. Visit a cathedral or even a monastery in Europe any time outside of Sunday mass and maybe you’ll see a handful of solitary believers lighting candles. More likely you’ll just see other tourists. Tibetan Buddhist monasteries and temples, on the other hand, were overflowing with monks devoted to study. Every day of the week, every time of day, pilgrims were everywhere, often having devoted large chunks of their lives walking there from isolated regions of Tibet (which is double the size of France! ), as well as India, Nepal, and Mongolia. Pungent aromas of yak butter, fresh incense, and people – lots of them – permeated every space. I was also struck by both the highly abstruse nature of the theology behind the religion, the elements of mysticism, and the almost pedantic application of a huge number of ancient rituals, from spinning prayer wheels to clockwise-only circumambulation, prayer beads, yak butter offerings, prayer flags, and prostration. 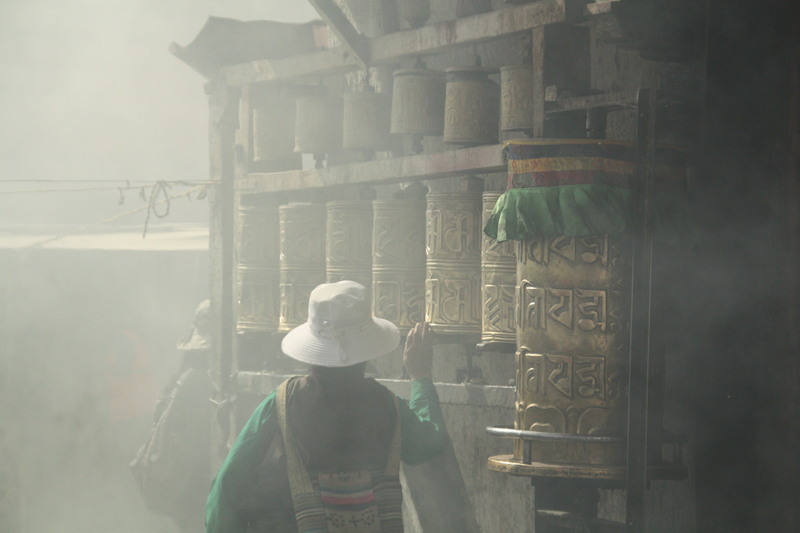 Spinning prayer wheels in the smoke of burning offerings, Lhasa, Tibet. I’ve always had a hard time understanding the rules and rituals associated with all organized religions and this was no different. But with so many people participating in so many ancient rituals you couldn’t help but feel you were witness to living history, which is an amazing thing to see. However, what struck me most about our time in Tibet was the militarization of the monasteries, and of the region as a whole. Beijing has always kept a close eye on the Tibetan Autonomous Region, and in the wake of the 2008 unrest, the entire area was closed to foreign tourists. 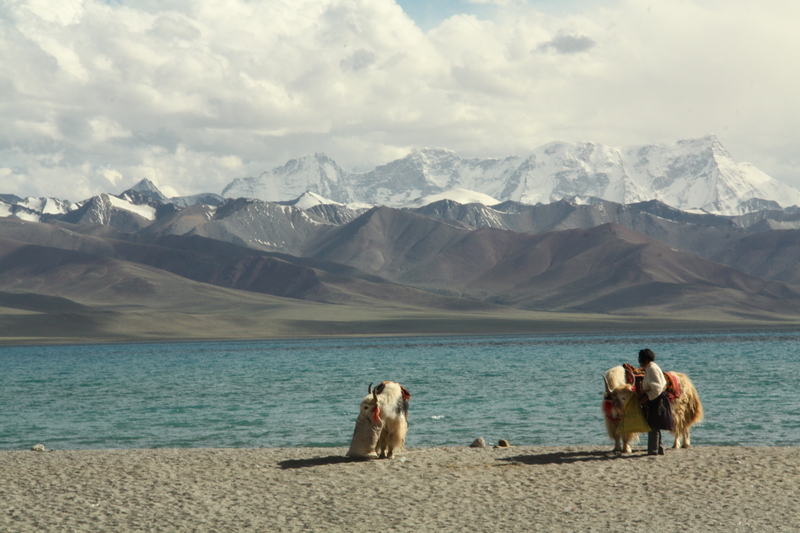 Tibet has since “re-opened” to foreign tourists, but with more stringent permit requirements, and only on the condition that you travel with a registered private guide or an organized tour. 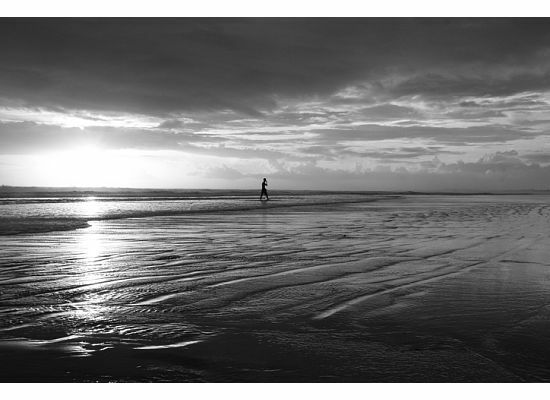 Independent travel remains almost impossible and very risky for foreigners. 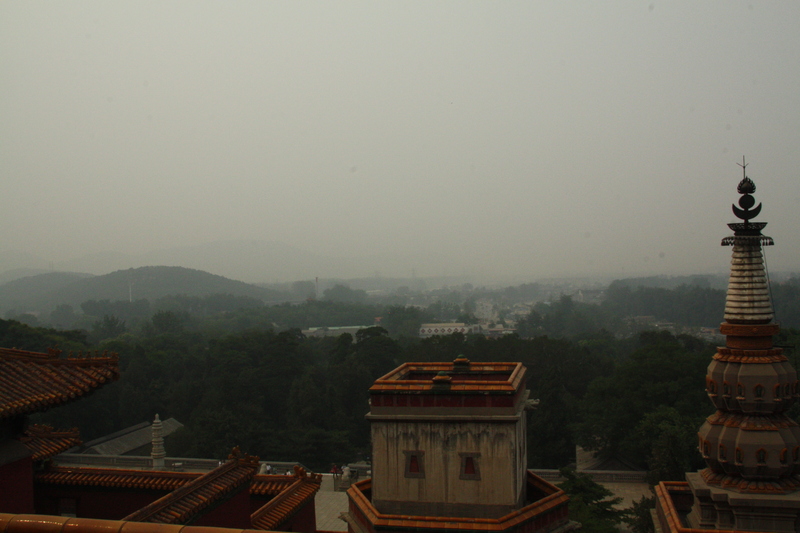 Many monasteries were outfitted with video surveillance cameras and armed guards, courtesy of the Chinese government. The huge entry fees associated with most of the sites went almost entirely to Beijing, surely to pay for the “security” provided. 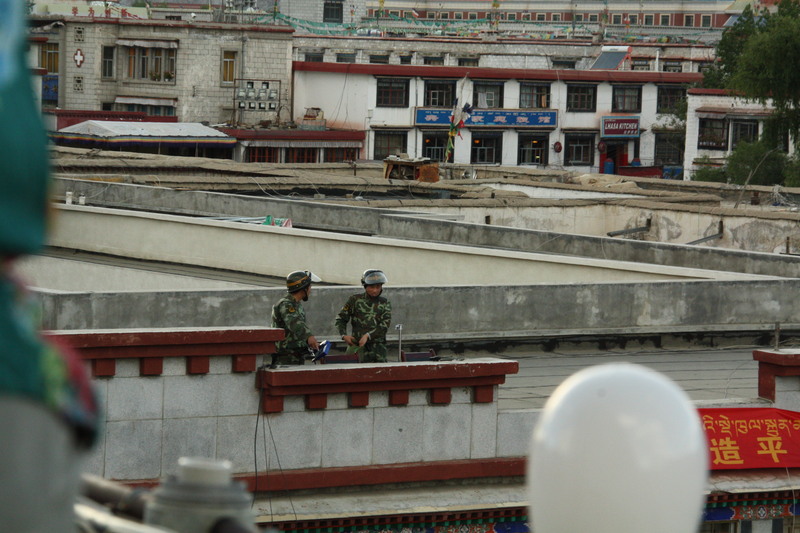 Lhasa was jammed with soldiers. Nearly every intersection had a guard station manned by 4-8 soldiers. Rooftops were littered with pairs of soldiers outfitted with binoculars, video cameras, and large, precision automatic rifles, constantly surveying the activity below. At the Ganden Monastery, on a deserted hillside about 40 kilometers outside of Lhasa, the Chinese government is constructing an adjacent military base. The new buildings, atop a barren mountain with absolutely nothing around for miles, directly abut the 600 year old monastery walls. With nothing around, there is no reason they couldn’t have built a couple hundred yards off to the side. 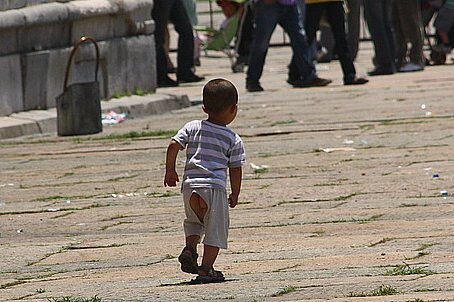 Yet, Tibetans seem undeterred. A close family member of our guide, for example, has been in jail for several years for speaking out against the government. Despite government regulations vastly limiting the number of monks allowed in residence, many hundreds still take their vows in each monastery (down from thousands of monks in residence before the regulations). People trek for hundreds of miles to attend religious festivals and make offering at sacred lakes. Through the Himalayas mostly at altitudes of more than 3500m, this is no easy trekking. 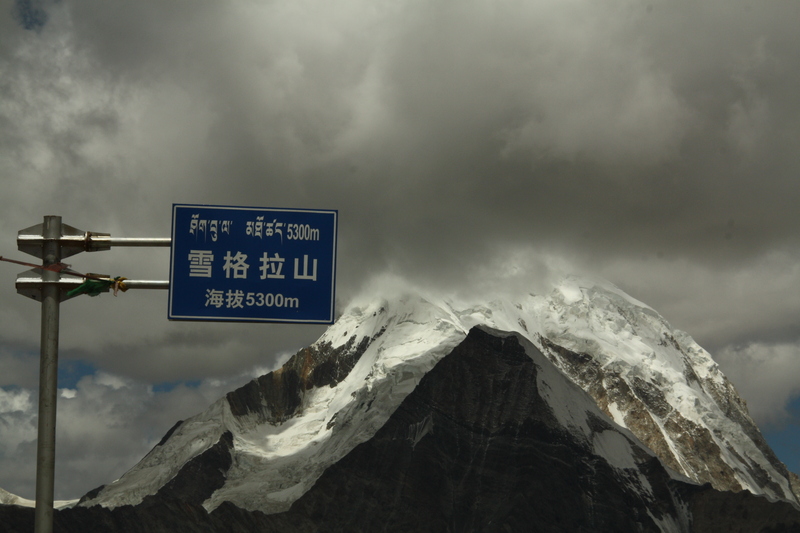 The highest pass we experienced in Tibet - 5300m / 17,390ft - even higher than Everest Base Camp! We were frustrated by the fact that so much of our tourist money was going to the government, undoubtedly to fund the “regulation” and “monitoring” of the area. 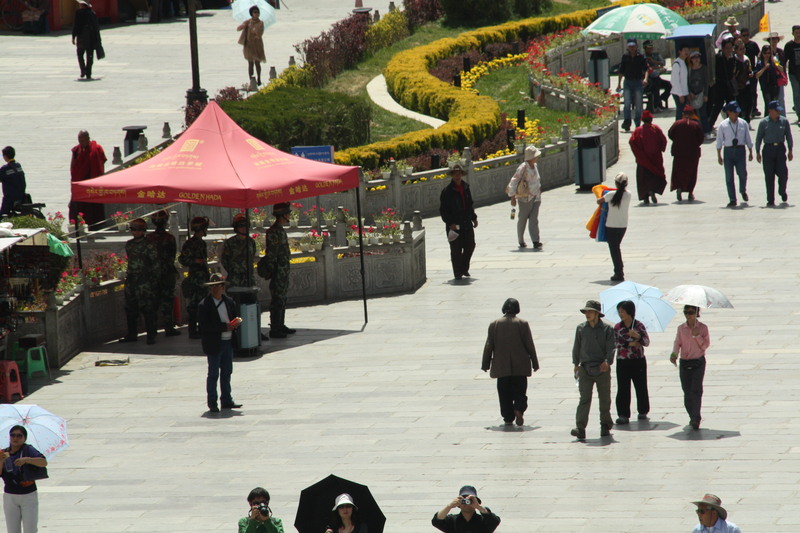 However, there were enormous numbers of Chinese tourists in Tibet – exponentially more than foreign tourists. I like to hope that the government will come around and see the tourist interest in the culture, religion and geography of Tibet as reason to actively preserve the culture rather than systematically dismantle it (obviously the culture and religion are worth preserving for reasons far more important and fundamental than as a tourist curiosity, but I’m less concerned about the Chinese government’s motivations than about the end result). Unfortunately, based on the number of army caravans we saw going in as we headed down from the plateau, I’m not so sure. My least favorite thing about South Africa 2010: hearing Shakira say “waca-waca” every five minutes. Argentina v. Nigeria: Some people had recommended the bar at the Phuntsok Khasang Hostel but that turned out to be quite far from where we were staying, so we headed to the oh-so-originally-named Traveler Bar instead. We shared the comfy sofas, traditional Chinese lamps, and large projector screen with a dozen or so Chinese tourists. Though they appreciated the novelty of watching the match with a real, live Argentinian, their loyalty to a high-scoring game was far greater than their loyalty to a fellow viewer from Argentina. They cheered every time either team got the ball more than about 3 meters past midfield. But, at least they livened up the small space, and they were appropriately congratulatory when Argentina came out with a victory. We flirted with the idea of staying for the US v. England game, which began at 12:30am local time, but on only our second day at altitude, we were feeling less than energetic, and had to make our way to bed. Argentina v. South Korea: The only accommodation at Everest Base Camp, where we were the day of the game, is a few nomad tents. Needless to say, they have no TV. On account of the confluence of several adverse factors, the group decided to head down early (I still wonder whether Max was faking that altitude fatigue for the sake of finding a TV…). We managed to make our way to the small village of Shegar before dark. Electricity at the guesthouse normally worked only from 8 to 10 pm, but the staff was nice enough to keep the TV in the reception area on for the duration of the match. We had no fellow viewers and the TV was so small and fuzzy that we could barely see the ball. But it was a victory for Argentina, so Max was happy, even if he couldn’t see the goals. USA v. Slovenia: Sports bars are tough to come by in the Tibetan city of Shigatse, and the late local start time made watching from the TV in our hotel room the only palatable option. The first 15 minutes of the game were painful to watch in their utter lack of skill and action, and reconfirmed why I avoided watching football for the last 30 years. I went to bed and got the score from Max in the morning, who claims the second half of the game was pretty good. 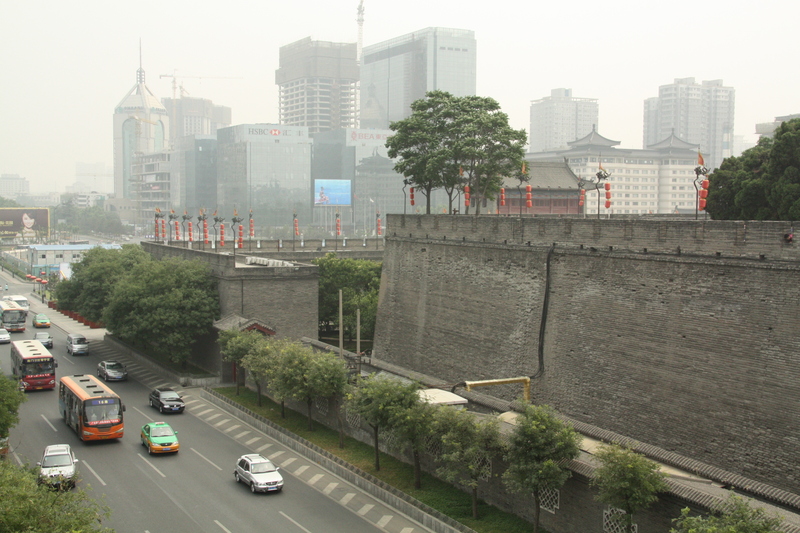 Argentina v. Greece: We arrived in Xi’an (in central China) at 10pm after a 35 hour train ride from Tibet. The game began at 2:30am local time. The local bars closed and, despite my best efforts, I fell asleep watching from the bed in the hotel room. It’s just not that fun to watch football in a solitary environment in the middle of the night. Max managed to stay up until 5am to see his team to victory. US v. Algeria: At 10pm local time, all the bars were playing the England/Slovenia game instead of the simultaneous US/Algeria game – understandable given the massive number of British travelers and the virtual absence of Americans outside of our national borders. So we joined approximately 98 Brits and 2 Slovenian fans to watch their match. For the duration, raucous Brits draped themselves in their flag and wildly waved the Algerian flag in an expression of all things anti-America. They were louder than the vuvuzelas. Finally, 86 minutes in, the half-dozen or so Americans present convinced the bar people to turn one small tv in the far corner of the bar to our game. At the end of 90 minutes the drunken, Algerian-flag-toting Brits did a victory lap – passing our screen just in time to catch the America goal – the one the put the US (not England!) – in first place in our group. The Brits made it through, the Americans made it through, but there were still upsets all around. The whole place was in an uproar. A good time was had by almost all. Finally, we found some World Cup spirit.